The 10th Edition of Notte Bianca was launched at St. Mary Magdalene Church, Merchant's Street, Valletta. Notte Bianca will take place on the 3rd October. Pictured: Notte Bianca 2014, people getting food at L-Ikla t-Tajba pop-up kitchen, a Valletta 2018 project. Photo credit: Elisa von Brockdorff. Notte Bianca, Malta’s most popular and well attended cultural event turns 10 this year and to celebrate, the team has an unforgettable special edition in store. 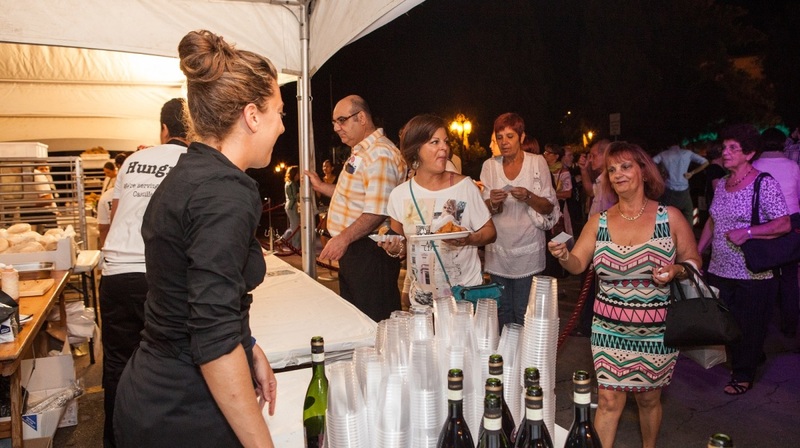 From Drifting to Flamenco to Maltese Cuisine with a twist and gravity defying acrobats, as always Notte Bianca has something lined up for everyone. Without a doubt, this October 3rd there’s only one place to be, and that’s Valletta for the 10 year anniversary edition of Notte Bianca. A press conference detailing this year’s Notte Bianca was held at the newly restored late 16th century Magdalene Chapel in Valletta which once formed part of a monastery well known for its incongruous female community and successful financial acumen. Culture Minister Owen Bonnici, Arts Council Malta chair Albert Marshall, Valletta 2018 Foundation chair Jason Micallef, Valletta mayor Alexiei Dingli and Notte Bianca artistic director Sean Buhagiar addressed the press and highlighted the importance of Notte Bianca as cornerstone of Malta’s cultural calendar. To be held on Saturday 3rd October, Notte Bianca 2015 will present a balanced mix of old favourites as well as innovative new events. Notte Bianca Artistic Director Sean Buhagiar said that for its tenth anniversary, a variety of activities have been planned. The Chairman of the Valletta 2018 Foundation Jason Micallef said that substance and quality are important with such events but it is imperative that a legacy is also forged for generations to come. Mr. Micallef also said that “The Valletta community is an integral part of the celebrations of Valletta 2018” in reference to Notte Bianca spreading throughout the entirety of Valletta, with events taking place at the Camarata building, thus including the Valletta community in the festivities. Mr. Micallef also spoke about projects that the Valletta 2018 Foundation is working on during Notte Bianca, namely L-Ikla t-Tajba and a lantern installation in Strait Street. Under head chef David Darmanin, youths from Aġenzija Żgħażagħ have put together their own specialty menus using traditional Maltese ingredients. These mouth-watering dishes will once again be prepared and served during Notte Bianca as street food from a pop-up kitchen. Valletta 2018, in collaboration with Mdina Glass, will also develop beautiful lanterns that will decorate Strait Street during Notte Bianca. Karaoke ta’ Vera, one of this year’s new additions, is a karaoke experience like no other. It will offer participants the once in a lifetime opportunity to sing a song of choice accompanied by a real, live band. Mikaela, The Busker and Xarulu will make sure that cheesy, synthesiser playbacks are nowhere to be heard. Fasten your seat belts! Team Maximum Lock’s engines are all revved up and ready to wow the crowds of Notte Bianca. With their professional drift stunts and impressive four-wheeled showmanship, Malta’s Number 1 Drift Team will put on a show that is sure to get the adrenalin pumping. Kamrata Pupi is a unique set of short performance sketches featuring handmade puppets by Sean Briffa. In collaboration with Christine Briffa Francalanza, Chris Briffa, Sarah Camilleri and the residents of the Kamrata itself, wild animals, robots and a giant come to life amidst clothes hung out to dry. Expect things to get loud and colourful in this curious mix of sci-fi and realism. Żiffażfin is back this year with an inclusive Street Dance community project aimed at those with a limited opportunity to perform. Following a number of workshops for beginners, amateurs and enthusiasts, the participants, including entire families, are now ready to give the performance of a lifetime. Expect everything from Hip-Hop to Parkour all over Valletta. Get ready for some very interactive Street Dance performances in flash-mob style! Creating a legacy and building on the success of previous editions, during FUQ!, the Valletta Planċieri will once again be out in all their glory hosting a large variety of gudgeon and brass bands. The audiences roaming the streets of Valletta will get to enjoy concerts and great music live from these traditional high stages. As in previous editions, Notte Bianca will not only include its own commissions and projects. Atmosfera, the programme of ancillary events inspired by the city’s pulsating heart will also be contributing to make the night a success. Churches, museums and other spaces will be open to visitors until the early hours and will make this a night truly worthy of its name. Notte Bianca is organised by Arts Council Malta under the Ministry for Justice, Culture and Local Government, with the support of Valletta 2018 Foundation, Valletta Local Council, Floriana Local Council, TVM, Shadeena and MSV Life.